The New Mexico Mounted Patrol creation and authority to be a New Mexico peace officer is outlined in the Laws of the State of New Mexico and can be found in the Criminal and Traffic Law Manual, (Article 6, New Mexico Mounted Patrol, Sections 29-6-1 to 29-6-6). 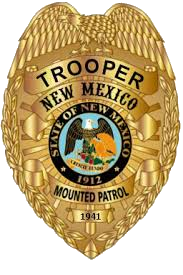 Welcome to the website of the Las Cruces Troop of the New Mexico Mounted Patrol. The New Mexico Mounted Patrol officially became a state law enforcment agency in 1941. The New Mexico Mounted Patrol (NMMP) is an unfunded state agency created by New Mexico State Law and staffed by certified volunteer police officers. The New Mexico Mounted Patrol is not a division of the State Police but is an independent state agency that can be called upon to assist any law enforcement agency and serve anywhere in the state. New Mexico Mounted Patrol Troopers may be called out by the Governor, the Chief of the State Police, or by any local or county police agency. The Las Cruces troop of the New Mexico Mounted Patrol serves law enforcement agencies around Southern New Mexico. Though Troopers of the New Mexico Mounted Patrol are volunteers, government agencies do have the option of compensating Troopers for their time, service, and fuel expenses, should they desire to. The New Mexico Mounted Patrol assists cities, counties, and other New Mexico Law Enforcement agencies as requested because these agencies cannot maintain the number of full-time police officers that are needed to safely cover their jurisdictional areas. By state statute, when on duty, NMMP Troopers assume the SAME duties, powers, and authority and accept the control of the agency for which they are working for. When requested by other agencies, NMMP Troopers augment their full time staff and assist these officers in the performance of their duties.